No two trucks are the same. There are thousands of options out there to customize your rig, including the many different types of wheels on the market. Whether you need to stay light or you’re hauling the heaviest of loads, you’ll need to choose from steel or aluminum wheels to get the job done. 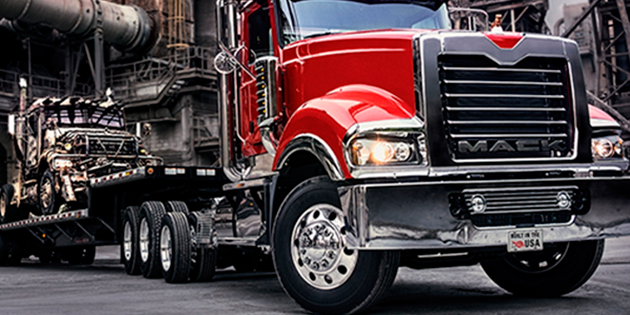 Steel wheels are built for brawn, just like a heavy-duty Mack® truck. Your average steel wheel weighs between 77 and 100 pounds, and is strong enough to take on any job. In fact, it’s recommended that trucks in severe applications such as logging, mining or tanker operations go the steel wheel route to combat load-related issues such as rim flange wear. This sharp, pitted wear on the flange is caused by abrasion from the tire chafer and sidewall when your truck’s rims are too narrow for its tires or its wheels are weighed down by an oversized, frequently shifting load. When a tire is demounted from a wheel with rim flange wear, the sharp edges of the flange can slice slivers of rubber out of the bead of the tire, potentially leading to sidewall separations and other dangerous conditions. At the very least, you could be looking at some serious downtime, potential Compliance, Safety and Accountability (CSA) violations and costly repairs. Steel wheels are also about three to four times cheaper than aluminum – something to consider when you don’t want to bust your bottom line. Despite the steeper price, about 40 to 50 percent of truck buyers opt to shell out the extra cash for aluminum wheels over steel. Why? Weight savings, resistance to corrosion and looks. An aluminum wheel can weigh up to 30 pounds less than a comparable steel wheel, so going aluminum can shave up to 500 pounds off a loaded truck and trailer. That can make a big difference for weight-sensitive applications such as bulk hauling, and can potentially improve your truck’s fuel efficiency. Because they’re specially treated – not painted like most steel wheels – aluminum wheels tend to be easier to maintain and can be more resistant to corrosion caused by harsh de-icing chemicals used on North American roadways. A truck driving on steel wheels in extreme environments may have to have its tires dismounted and the wheels painted or touched up every year in order to keep the rust at bay, while you can keep aluminum wheels looking pretty with mild soap, water and polish. Shiny aluminum wheels on a fleet may even improve a trucking company’s image and help with driver retention. But, steel wheels are closing the gap in the corrosion department. Several manufacturers now offer specially coated steel wheels that meet North American SAE salt-spray ratings of between 1,200-3,000 hours. This is comparable to – or beats – many other value-option aluminum wheels on the market. Whether you go with steel or aluminum, ask the factory-trained technicians at your nearest Mack Trucks dealership to make a wheel inspection part of each preventive maintenance visit to help you stay ahead of rust, corrosion and other potential problems. We can help you find the best replacement wheels for your specific application. Or shop online through SELECT Part Store™ for ease, convenience and fast delivery.